Have you been struggling to keep your balance recently? Have you felt unsteady on your feet, or almost lost your balance walking down the stairs? Hearing issues can impact your balance, and those with hearing loss experience far more trips, slips, and falls than their hearing peers. Thankfully, treating hearing loss with a quality pair of hearing aids can improve balance issues, and keep you on your feet. If you have hearing loss, you most likely have experienced some balance issues. Hearing loss affects your ability to have a conversation, hear in places with background noise, and maintain close relationships. Hearing loss also has a huge impact on your balance, and those with hearing loss are far more likely to fall or be in an accident. A recent study showed that those with hearing loss are 3 times more likely to fall or struggle to maintain their balance. Those with hearing loss also visit the doctor on average 54 times more than someone with normal hearing, and are hospitalized more often than their hearing peers. “People with impaired hearing have poor awareness of their overall environment,” says Dr. Frank Lin, an Otologist at Johns Hopkins University School of Medicine, “and that makes them more likely to trip and fall.” On top of that, if you’re not able to hear clearly, your brain is working over time to try to make sense of the sounds in your environment, and all the auditory information reaching your brain can become overwhelming. You might dedicate more brain power to making sense of these sounds, and don’t have enough cognitive power left over to maintain awareness of walking and balancing. If you’ve been struggling to hear, or noticed any issues balancing, then you need to consider investing in hearing aids. A recent study from the Washington University School of Medicine in St. Louis examined how hearing aids could improve balance, and they discovered that seniors with hearing aids had far better balance than those who ignored their hearing loss. The study tested balance in seniors over the age of 65 by having them balance on a foam pad, or stand with one foot in front of the other. They had to perform the balance tests with their eyes closed and rely on their internal balance, and researchers measured how long they could balance. They first performed the test with their hearing aids off, and later they balanced again with their hearing aids turned on. The results showed that when they had their hearing aids turned on, the seniors were able to balance for far longer! And the seniors who struggled the most with their balance received the most benefit from having their hearing devices active. For those with the worst balance, some had their balancing time double when they used their hearing aids. 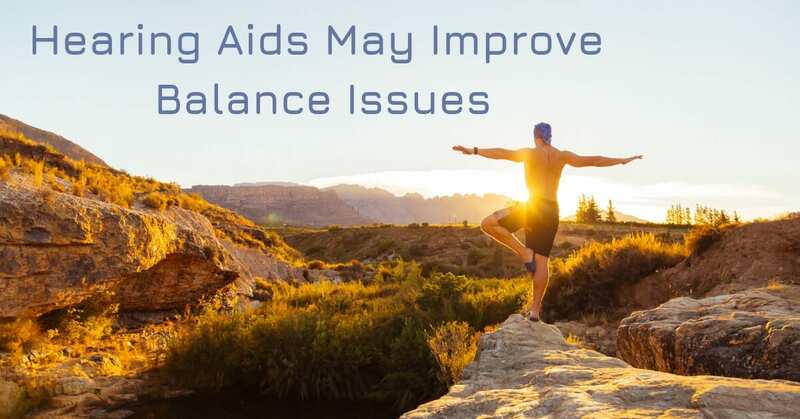 Not only do hearing aids improve balance, but they improve overall health and wellbeing in ways that might surprise you. Hearing aids make it easy for you to hold conversations with friends and loved ones, whether at home or in places with a lot of background noise. You don’t need to feel confused about what’s been said, embarrassed to ask someone to repeat themselves, or afraid that you’ve answered inappropriately. You’ll be able to maintain close relationships, and have an active social life. You’ll also decrease your chances of social isolation or depression, and will enjoy a more active lifestyle as you are able to get out more to meet friends an enjoy your favorite leisure activities. Hearing aids improve balance, reduce your risk of trips, slips and falls, and increases your quality of life. If you’ve been living with untreated hearing loss, don’t waste another day, but call us today at My Hearing Centers to book a hearing test, and see what hearing devices can do for you. We’ll test your hearing, and suggest the perfect devices to fit your hearing needs. You’ll be able to enjoy all life has to offer, stop struggling to hear, and know that you’re far safer than ever before. Visit us today at My Hearing Centers, and take control of your hearing health.